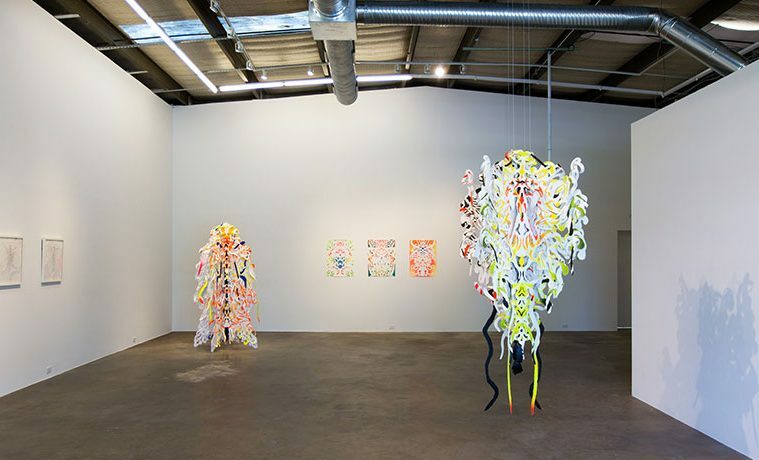 Jimmy Joe Roche, CRIMCRAW, Installation view at Erin Cluley Gallery, 2014. Courtesy of the Artist and Erin Cluley Gallery, Photo by Kevin Todora. 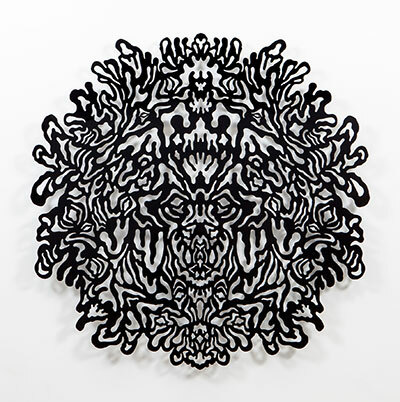 Jimmy Joe Roche, Reflective Monochrome (Black), 2014, laser cut, powder coated aluminum. Photo courtesy of the artist and Erin Cluley Gallery. Photo by Kevin Todora. Entering Jimmy Joe Roche’s show, CRIMCRAW, at the Erin Cluley Gallery, I was initially struck with the continuity in the works’ forms: organic lines creating shapes which translate into three-dimensional substance are the prevailing motif in this exhibition. However, what isn’t noticeable by casual aesthetics examination proves to be the most intriguing. 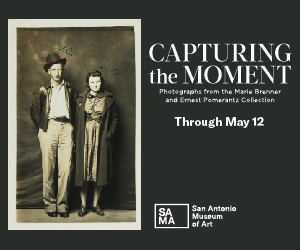 There are drawings with “automatic” in their titles, stemming from the application of the word by William Burroughs and Brion Gysin to describe strategies for writing, as well as a popular strategy for drawing in the Surrealist camp; in these contexts, the word “automatic” attesting to the interest and trust in the subconscious. Roche uses a variety of media to articulate his formal explorations including hand drawing, lithography, video, painting and computer-assisted fabrication. All media aside, the acknowledgement of the “automatic,” both in terms of the non-judged (or, pre-judgmental) intuitive movements and the calculated accuracy of computers is a compelling insight into Roche’s innate formal preferences. Speaking with Roche, he divulged that the works were not part of a singular conceptual vein; however they still present themselves as a recognizable family when viewed together. According to Roche the automatic drawings were a method used to liberate his drawing practice; he used oblique strategies to work through what he perceived to be common patterns (crutches perhaps?) in said practice. The outcomes of these exercises have attempted symmetry, and although in reality are asymmetrical, they struggle toward that solution to approach balance. By contrast, pieces like Reflected Monochrome (Black) and (White), which are machine-cut, are testaments to symmetry and dichotomy. The free-standing sculptures combine these two approaches with machined wooden forms lending structure to hand-cut and painted paper shapes which weave around and through the negative spaces of the wooden skeleton. Roche’s aesthetic solutions seem to follow a natural proclivity for symmetry. The drawings illustrate the mind’s attempt to articulate this through the body, while mechanical solutions provide the mind with precision that the body cannot. Roche uses mandala-like, totemic modes of organization which seem ritualistic in their production and the structure of persistent inquisition is evident throughout this exhibition. This said, Roche’s structural themes don’t come across as strategic or formulaic, but rather as personal impulse utilized to articulate intriguing formal assets. Bill Bridges is an artist who lives and works in the Dallas/Fort Worth area. 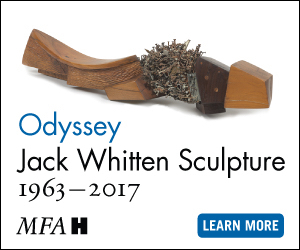 He holds an MFA in Sculpture from the University of North Texas.